The other major piece of equipment in the setup is the Roland GR-30. This is Roland's latest model guitar synthesizer. When coupled with a guitar equipped with a special divided pickup/controller, it puts a large array of sounds at your disposal. One of my favorite GR-30 features is that you can assign the sounds to any individual string or group of strings. This is great boon to fingerstyle guitarists because you can, for example, place one of the many bass (or tuba!) patches on your low E and A strings and have an instant bottom. In my current arrangement, the GR-30 also serves as a midi program change pedal for a Digitech 128 (an older effects processor) I muted the entire first bank of patches to use when playing the acoustic guitar straight without any synth. Basically, I use these four patches (A11 to A14) to call up various strengths of reverb & delay that I commonly use. This change has simplified the setup a little and eliminated the need for an extra pedal to control effects. For more information on the digital guitar and a great many other music toys, visit: "One-Person Band" John Pollock's very in depth Troubadour Tech, and The MIDI Guitar Unofficial Home Page. The reason I have placed the volume pedal last in the chain is that there, it allows me to manually fade out compositions made with the JamMan. 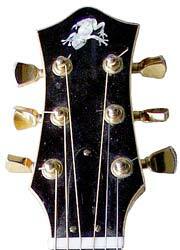 The RMC Pickup consists of six "Acoustic Gold" individual saddle transducers. I chose the option of having onboard electronics with RMC's "Poly Drive IV". It gives you 3-band EQ, the 2 synth drive control buttons, guitar volume and synth volume. The only drawback here was having to saw two good-sized orifices in one of my new guitars. But it was worth it to me to have the onboard controls and besides, the pickup works great. Some of Richard McClish's RMC Pickup Company products are shown installed below (left to right): the 6 "Acoustic Gold" saddle transducers, the Poly Drive IV control panel, and the Polyphonic Output Jackplate. My goal is to make my equipment setup simpler, smaller, and more portable without giving up any of its versatility. The majority of the 6-space rack is now dedicated to processing the straight acoustic guitar sound. 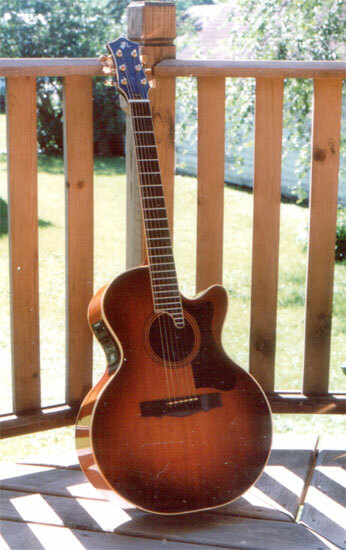 The guitar shown above is one of my handmade fingerstyle guitars. I've found that my standard fingerboard width of 1 7/8" is particularly suited for the clean playing required for MIDI guitar.